An interactive community of Scottish arts organisations working to reduce their environmental impact. 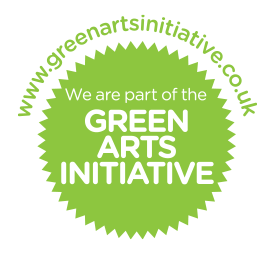 All members use the Green Arts Initiative branding on their publicity, online, and in their building, to demonstrate their commitment to developing a greener arts sector throughout Scotland. Please enter the name of the Scottish cultural organisation wishing to join the Green Arts Initiative. Please nominate an individual Green Champion. They will be the primary point of contact for anything Green Arts Initiative related. Please enter the email address of the Green Champion. To help us focus the support we provide, please indicate what art form you are most aligned with. Please confirm your commitment to joining the GAI by ticking both of these boxes. Invitations to member events for the Green Arts community including an annual conference for sharing sector best-practice in sustainability. A supply of Green Arts Initiative printed and digital branding, to highlight your membership of this nationwide network to everyone you work with. Contact time via phone and email to answer your queries and research problems. Downloadable guides and resources to keep you up to date with what you need to know. We have over 200 members across Scotland, and a huge range of members: from individual artists and collectives, to high profile venues and the premises of office-based arts organisations.